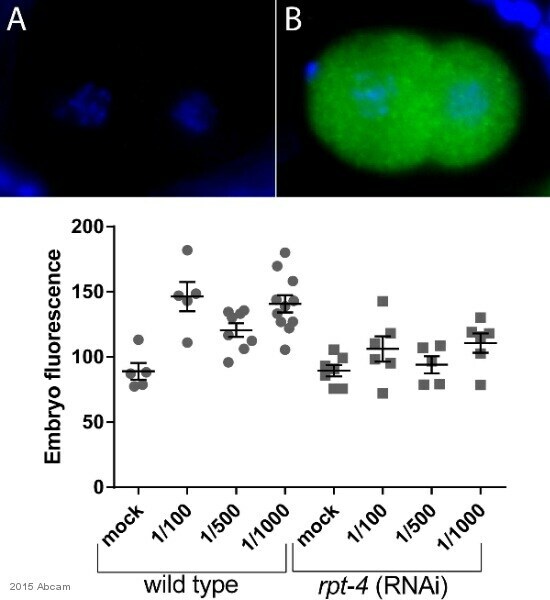 HeLa S3 cytosolic preparation and human placental proteasome preparation. Our Abpromise guarantee covers the use of ab22639 in the following tested applications. WB Use at an assay dependent concentration. Detects a band of approximately 44 kDa. Immunocytochemistry/ Immunofluorescence - Anti-PSMC6 antibody [p42-23] (ab22639)Image from Rousseau Erwann et. al. J. Biol. Chem., Vol. 284, Issue 3, 1917-1929 (Fig 1A). ab22639 staining PSMC6 in mock transfected rat primary neurons by Immunocytochemistry/ Immunofluorescence. Primary cultures of rat hippocampal neurons were prepared from E18 rats. Cells were fixed in 4% paraformaldehyde and incubated with primary antibody at 1/1000 dilution. The image show red staining with ab22639, nucleus was stained blue with Hoechst H33258 and right image show merged images. The green color seen in right image is the GFP staining in similar experiment. IHC image of ab22639 staining in human normal pancrease formalin fixed paraffin embedded tissue section, performed on a Leica BondTM system using the standard protocol F. The section was pre-treated using heat mediated antigen retrieval with sodium citrate buffer (pH6, epitope retrieval solution 1) for 20 mins. The section was then incubated with ab22639, 1µg/ml, for 15 mins at room temperature and detected using an HRP conjugated compact polymer system. DAB was used as the chromogen. The section was then counterstained with haematoxylin and mounted with DPX. Overlay histogram showing HeLa cells stained with ab22639 (red line). The cells were fixed with 80% methanol (5 min) and then permeabilized with 0.1% PBS-Tween for 20 min. The cells were then incubated in 1x PBS / 10% normal goat serum / 0.3M glycine to block non-specific protein-protein interactions followed by the antibody (ab22639, 1/100 dilution) for 30 min at 22ºC. The secondary antibody used was DyLight® 488 goat anti-mouse IgG (H+L) (ab96879) at 1/500 dilution for 30 min at 22ºC. Isotype control antibody (black line) was mouse IgG2a [ICIGG2A] (ab91361, 1µg/1x106 cells) used under the same conditions. Acquisition of >5,000 events was performed. Publishing research using ab22639? Please let us know so that we can cite the reference in this datasheet.